It is not inadequacy that is my enemy, it is my belief that I should be above inadequacy. Perfectionism is the enemy of art. 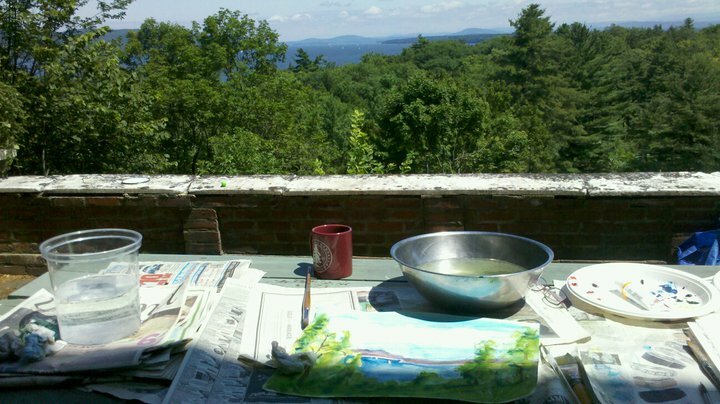 On a few summer afternoons, my father and I painted on the porch of the Big House. We’d just come back from painting classes in Burlington, Vermont and we could experiment with new techniques. The feeling of a paintbrush in my fingers thrills me, but my paintings? Not so much. I fail to make art or share it, because I know it’s not perfect. Not yet. I do not want to expose myself to other’s criticism or hear their good and helpful ideas. I think I must throw it all out there, acknowledge my work is a work in progress. As is my life. I remember this slogan from a 12-step meeting, “high perfectionism, low productivity; low perfectionism, high productivity.” If my work is good enough and done, that is far better than perfect and never done.